Let’s say that you have already promoted your real estate business by creating a beautiful website, handing out business cards and even advertising in the local newspaper. You have taken steps to self-promote and that is valuable. But how proactive are you when it comes to soliciting reviews? Sometimes, what you have to say about yourself is not as significant as what other people are saying about you. Do you have people reviewing you, your services, or your website and blog at social media sites such as Facebook, Twitter and Yelp.com, and Google Maps, Bing, Yahoo Local, City Search and Local.com? If you are active in your business, client reviews should already be appearing naturally. However, there isn’t a whole lot you can do to moderate the content of these reviews. At most, you can ask and encourage your happy clientele to post positively on your behalf. In the instance that you find the dreaded negative review, you can sometimes respond or get the reviewer to remove or modify it. Unfortunately, your control over what is said about you on the Web is minimal. Why not take some control and have your own reviews on your site? This isn’t just a page where you post nice things your clients say about you. Many of us already do that. The trick is to get those comments “microformat enabled” as hReview entries. You see, sites like Google Places and Google Local Search are now looking specifically for that format. 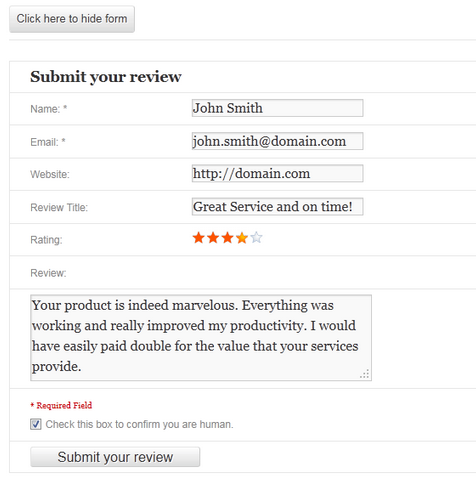 hReview entries work to indicate a review and can be displayed as such in special areas of sites and search results. 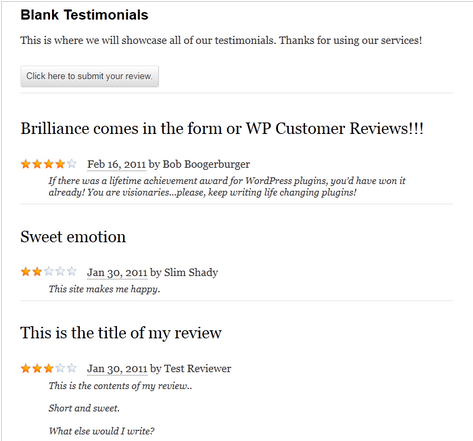 WP blank testimonials are Microformat enabled. Every happy client should receive an email from you with a link to this page and a request to do a review. In time, you will be building a page full of positive reviews, and these reviews will be specially indexed as hReview formatted entries. They should start showing up on pages around the Web that search specifically for reviews or within searches with the word “review” in them. A bonus here is that you can also use this plugin to place a review button at the bottom of posts or pages about your local sites, restaurants, and other businesses. This will encourage your visitors to submit reviews for those as well, which in turn, will provide more Internet exposure for your site. Hi gang! Great article, and thanks for the mention! You are right – reviews on your site give you much more control. The plugin is an especially good fit for real estate sites. We’ve got a new version of WP Customer Reviews on the way soon, so be on the lookout for that. Hi Joey. Thanks! We’ll definitely keep an eye out for the new version!